Surprised I don't have G.INP yet. I had a new line installed. It wasn't a pair swap really. It's a new line. The pair used for the old line is still there. 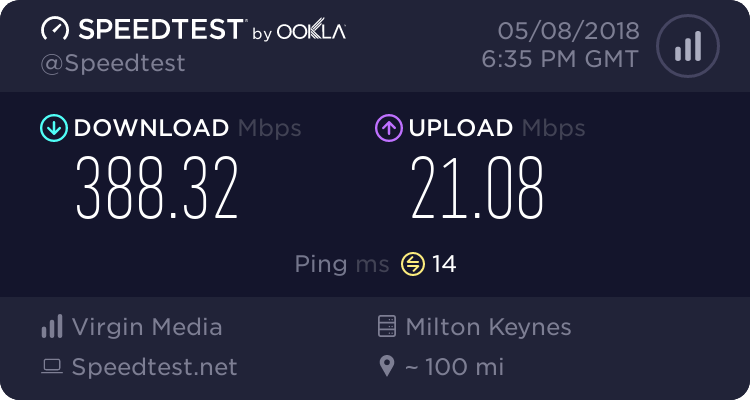 My brother (Jonski on MDWS) recently moved back to Thanet, so although it appears his line used to have G.INP, it is in fact a brand new FTTC install on a recently installed Huawei twin to an ECI. The line was activated on Wednesday. If you look at the sporadic stats you'll see a huge jump in the attainable as he was using a bog standard cheap and nasty very old extension cable, and then moved the HG612 to the master socket. The HLOG also showed what looked like bridge taps, but was just down to the extension lead. No sisters at all, three brothers, two have fttc but only one collects stats , the other has adsl with speeds that suites his needs and is affordable for him. I'am sure I checked this less than a week ago and at that time I was the only active, Huawei cab member who had never been G.Inp active. From memory, at that time there were no G.Inp inactive (orange) listings, certainly not 9. There are quite a number of active users listed as neither Huawei or ECI cabs who have never had G.Inp applied, this has always been the case in the short time I have been active on MDWS. Definitely not, I've been in that bracket since February. You must have been looking at the list wrong as there was definitely a similar figure a few weeks ago. Since 1st July six users have had G.INP disabled and two (different users) were enabled. In the time period that is an unusually high number of disables. OK, I could well be wrong, I quite often am ! Are we all talking about Huawei FTTC cabinet, active users only stat's excluding ECI cab users ? I'm 'bkehoe' on mydslwebstats and moved home just over 2 weeks ago, still on Huawei cabinet and 8926. Spent 2 days on fastpath with 77mbit sync downstream but quite a few ES. Interleaved for over 2 weeks now with no sign of G.INP being enabled or any reduction in target SNR from 6dB. Approx 250m from cabinet. Sorry to hear that you have been waiting since February for G.Inp application, looking at your MDWS stat's which you have religiously maintained, you could certainly use G.Inp on your line. Can I ask, what caused the quite dramatic change to your MDWS stat's on 14th. June where your DS ES rate reduced considerably, DS interleaving application/modification I would guess ? Yes, your G.Inp waiting period certainly greatly exceeds mine, just short of 7 weeks, I won't hold my breath ! Did you ever take the G.Inp non application issue up with your ISP and if so what was the response. I certainly have not to date, have the feeling it would be a complete waste of time anyway as the whole G.Inp issue appears to be shrouded in secrecy and a very grey area. I take it you have moved to another Huawei FTTC cabinet ? Are you still on the same exchange ? From MDWS I see your DS ES rate is zero, obviously due to the quite severe DS interleaving now applied. You are indicating that G.Inp was previously applied to you line, I'am not sure if this information is taken from MDWS records or BT DSLAM/RAMBo records, sure the more knowledgable members of the forum will be able to answer this for you. Unless you have only moved a very short distance your line is very likely on a different cabinet/DSLAM. In the current scheme of things with respect to G.Inp implementation it's still very early days for your line, see j0hn's post in this thread, I am fibre connected now for close to 7 weeks and still waiting. My line is currently good enough to keep DS interleaving off (most of the time) but G.Inp would obviously make it even better, why can't I have it ? My MDWS ID is as per this forum name.